The Club was founded in 1889 by Thomas Stewart of Greenloaning. 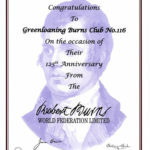 It was one of the earliest Clubs to be affiliated into the Federation of Burns Clubs and is number 116 on their register. Thomas Stewart, the founder, was Chairman for the first twelve years, during which time the membership grew from eight to over thirty members. In the early years of the Club, an annual concert was staged to raise funds for the annual community outing for both the adults and children of Greenloaning. The original suppers were held in Greenloaning Inn – or Mary-Ann’s as it was colloquially known after the inn Keeper Mary Anderson – where it is reputed that Robert Burns stayed the night en route to Crieff during his travels of 1787. Bob Robertson of Kinbuck donated the original bar bell from Mary-Ann’s to the Club a few years ago; a bell which Burns himself probably rang in drouthy anticipation (after a hard day in the saddle!). The Reception Bell from Mary-Ann’s, mounted on wooden base with engraved plaque. Straucht forrit, honest as the licht o’ day. From this poem, we also learn the toasts included one to Agriculture and one to Education. The meetings and suppers were held in Mary-Ann’s Inn until the time of her death (date not known) and thereafter moved to the Allanbank. The venue for the suppers was the “Coachman’s Bothy” – later this was turned into a dining hall and later still a restaurant. We also know that in 1938, according to former committee member Geordie Smith, Mr & Mrs Miller were “Mine Hosts” at the Allanbank hotel. The club’s annual supper was believed to be supended during the years 1915-1918 and 1940-1945. This information was gleaned from conversations with Mrs Joan McIntosh, widow of the late past president, Ian McIntosh. We know that at some point after the Second World War, the suppers moved from the Allanbank to the Braco Hotel – again the precise year is not known as the minutes only go back to 1969. The Club moved back to the Allanbank Hotel in 1982 and the suppers were held there until we had to move to the Village Hall in Braco in February 1993 as the Allanbank was unoccupied at the time. 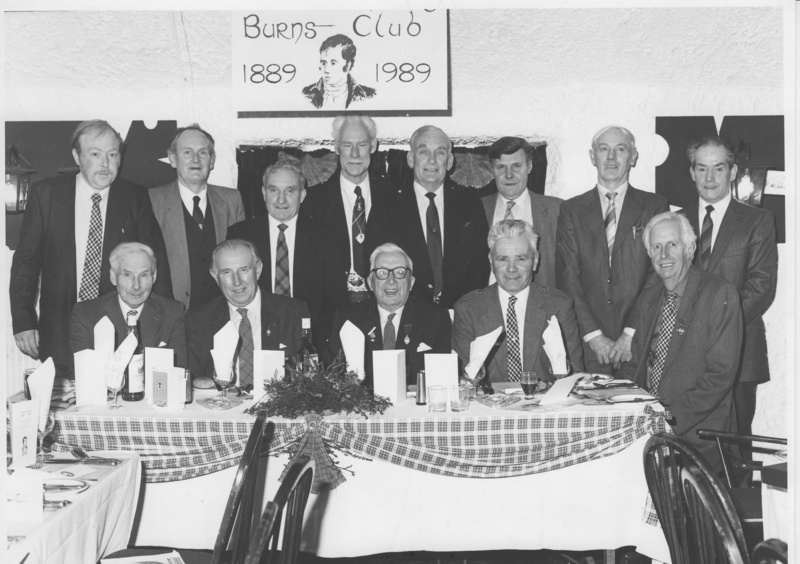 The Club was honoured in 1970 when Dan McIldowie was appointed President of the World Federation of Burns Clubs. During his year in office he travelled the world including to Australia and New Zealand to attend Burns Suppers and represent the Federation. 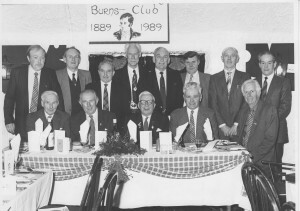 The 1988 supper was held in the Dunblane Golf Club (not sure why – maybe no-one at the Allanbank at the time?) and was infamous not just for being the only occasion it was held there but also because during Tom Scott’s vote of thanks to the artistes, the bar went on fire and we had to evacuate the building. Fergie lost his wallies in the ensuing melee! 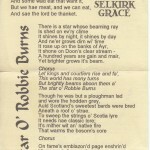 The Club’s Centenary Supper was held in the Allanbank in 1989.There were 96 present at the supper held in the dowstairs lounge; A couthieness that has become Greenloanings heretage and custom was everpresent that night and when ” the supper crowns their simple board, The halesome parritch, chief of Scotia’s food’ we all dined like kings. The top table at one end of a long room, the bar at the oppisite end; the room some 30 feet wide by around 120 feet long and filled with smoke and cronies and the entertainment sublime. Front Row (L to R) Alastiar Stweart, Ian McIntosh, Daniel McIldowie, Jim Dawson, Ian Collie. and we do not have our life again. and the running, the running down the road. And Strangers seeking, whether for cure or comprehension, Answers that we not theirs to have, nor their bright bairns’ to give. it is only of life before us; as a deep spring. 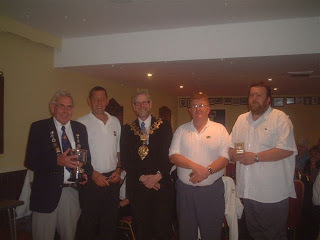 In 2008 long standing member and club stalwart, Harry Mclelland, won the area Bowling Cup by beating Denny Burns club in the final. The cup was retained the following year, 2009. Subsequent wins followed in 2010 & 2011 for the fourth consecutive year. 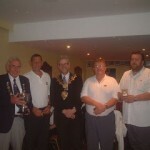 Harry, far left, holding the area bowling cup. The cup was presented by the President of the Federation, centre. The club has certainly come along way since being founded in 1889 with its eight members. 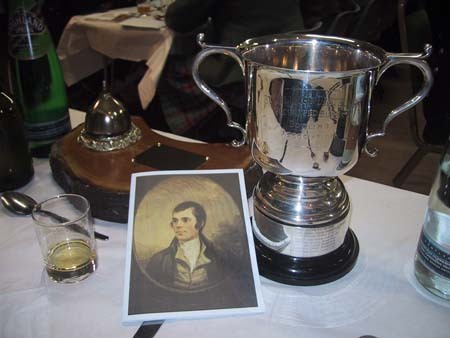 The suppers are now attended by around 100 members at its annual gathering on the first Friday in February, to celebrate the Bards birth. The majority of contributions come from within the club; The speaker who deleivers the toast to the immortal memory, is usually invited back to toast the lassies the following year. The suppers usually start at 7.00 for 7.30 and the finish time is targetted for 12.30 with a close at 1 am. The chairman is charged with “driving the suppers through the evening” with the same gusto and trepidation as ” Tam skelpit on thro’ dub and mire, Despising wind, and rain, and fire” and he always arives with Meg’s Tail intact! In 2009 Greenlaoning Burns Club changed caterers as our previous caterers, Jeeves were moving on to patures new. Many thanks to the years of loyal service you gave us. Our Supper on Friday 7th of February 2014 marked the 125th anniversary and was held in Braco Village Hall, “Thie night drive on wi’sangs an clatter, an’ aye, the ale was growing better, The company told their queerest stories and everyones laugh was ready chorus” A wonderful evening was held with over 90 guests and speakers That would have made Thomas Stewart and the original eight members from 1889 proud indeed. 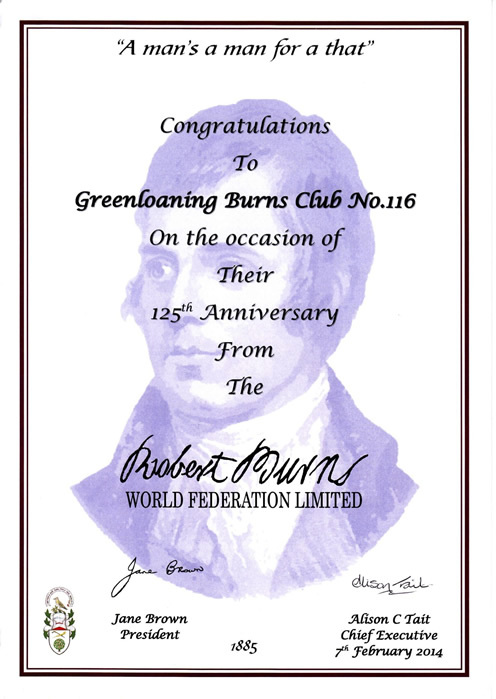 We were especially honoured by receiving the certificate below from Alison Tait, CEO at the Robert Burns World Federation in recognition of reaching this “ripe old age” The toast to Greenloaning Burns Club aptly concluded with a toast to the next 125 years.